Rain showers will continue for the valley Saturday evening into early Sunday morning with the passage of a cold front. This cold front will also bring colder temperatures overnight. Sacramento is expecting and an overnight low of 39° and Foothill locations will be much colder. This colder air will help to lower snow levels. Overnight snow levels will drop just below 1,000 ft in the overnight and remain there during much of the day on Sunday. Many foothill locations could see up to 5 inches of snow. The snow isn't the only story for foothill locations, temperatures in the foothills will be below freezing early Sunday morning. And wet roadways mixed with freezing temperatures will set up the perfect scenario for black ice formation. Drive slowly when crossing overpasses and secondary roads that aren't traveled as often as major roadways. For the Sierra, it's all about the snow. Whiteout conditions are possible along with major travel delays. Travel is highly discouraged. 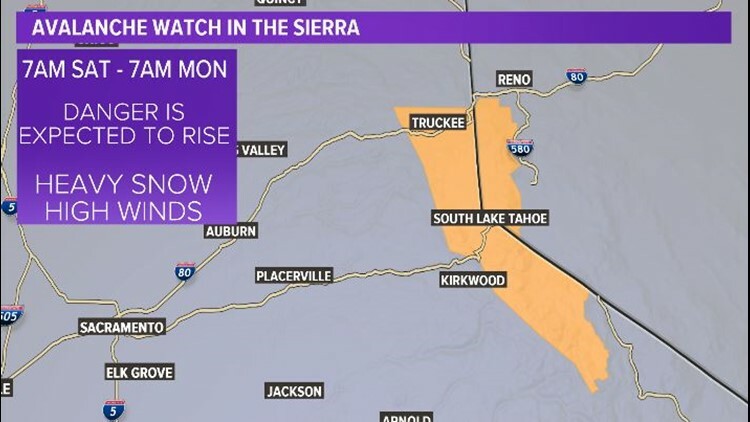 For this reason, there is a Winter Storm Warning in effect above 2500 ft for the Sierra until 4 a.m. Monday. 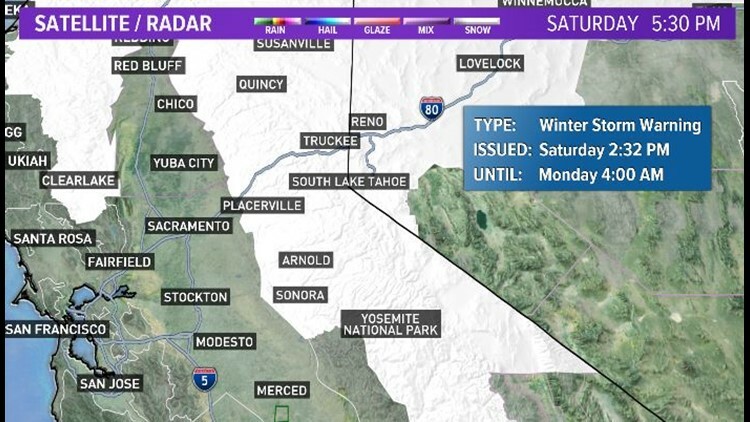 Heavy snow showers in the Sierra have already led to road closures. As of 5:30 p.m. on Saturday, I-80 is closed from Colfax to the Nevada state line due to multiple spin-outs. Moderate to heavy snow showers will remain in the forecast til Sunday morning. Strong winds are expected Saturday afternoon and evening with gusts up to 40 and 50 mph in the highest elevations. Snow totals up to 5' above 3,000 ft in elevation, 4-8" down to 2,500 ft in elevation. 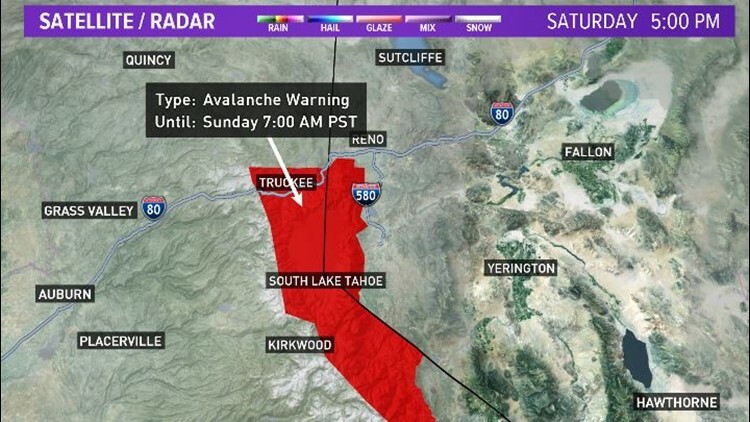 Heavy snowfall has led to an Avalanche Warning which is in effect til 7 a.m. Sunday. Two different storm systems will impact Northern California this weekend. The first storm arrives Friday afternoon, bringing rain to the valley and foothills along with snow to the Sierra. Rainfall totals in the valley will range up to 1" into early Monday morning. Foothill locations could see 1-2" of rainfall from this weekend's storms. A Winter Storm Warning is in effect from Friday afternoon until early Monday morning. Areas above 3,000 ft in elevation could pick up 3-4' of snowfall, locally up to 5 ft of snow. Areas above 2,500 ft in elevation could pick up 4-8" of snow. Tap here to see the current weather conditions in your area. Because of the heavy snowfall, mountain travel will be hazardous. This weekend expect major travel delays. There will be chain controls, possible road closures, and near white-out conditions at times. Travel during this time frame is highly discouraged. That being said, for the area ski resorts it's more good news. Snow totals will average around 25" from Friday to Tuesday. 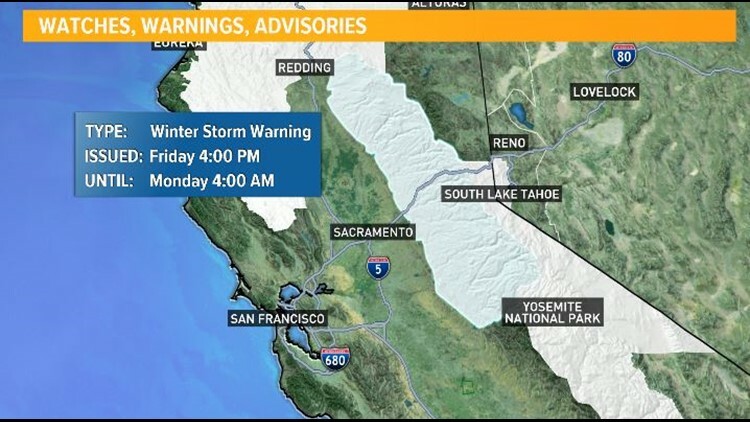 As more snow arrives to the Sierra, there is the danger of avalanches. The danger is expected to be high, due to forecasted heavy snow and wind. This storm will exit the region by Monday, bringing some sunshine. The sunshine won't be sticking around for long, though. 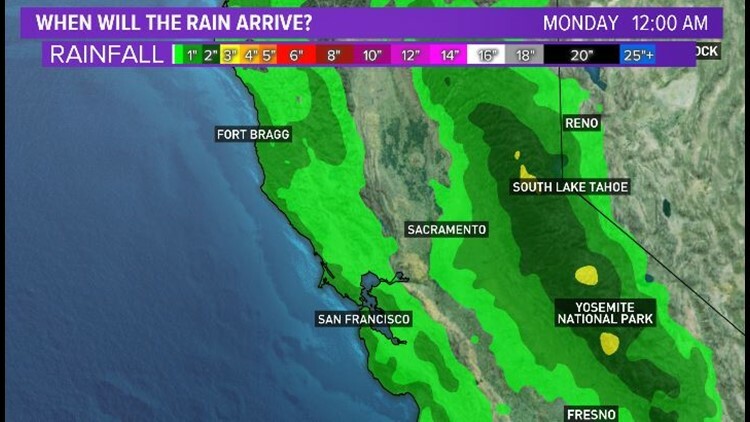 More rain and snow is back in the forecast for the rest of the upcoming week. 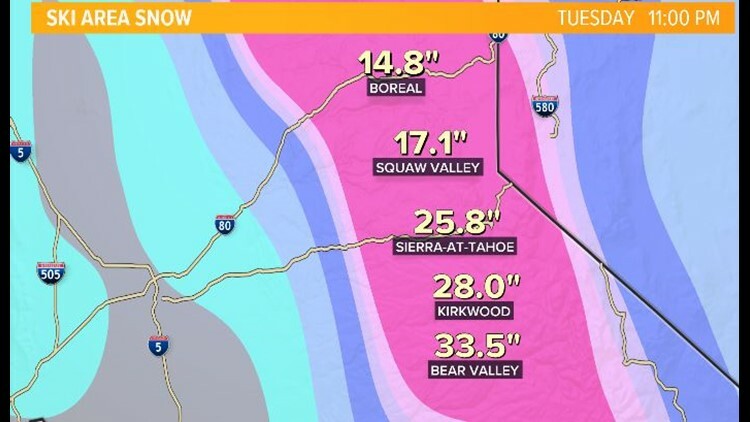 California officials say January storms have pushed the Sierra Nevada snowpack to 98 percent of average to date, which is good news for state water supplies.